Little chicken salad rolls is a truly mouth watering dish that is healthy and just takes approximately an hour to make. To make your little chicken salad rolls first take a large frying pan and, using a medium heat, bring the stock and ginger to the boil. Next reduce the heat to a simmer and place the chicken in the frying pan with the stock and ginger. At this stage the frying pan should be covered and the contents cooked for approximately 15 minutes. During this stage of the process you should turn the chicken meat over in the frying pan after approximately 8 minutes, to ensure that the meat is evenly cooked on both sides. Next take the chicken from the frying pan and dispose of the stock, as you will have no further use for it during the making of this dish. Once the chicken has cooled down sufficiently to make it comfortable to handle, shred the meat with your hands. Next take a large bowl and mix the vinegar and soy sauce together before adding the carrot, red capsicum and chicken meat, ensuring that you gently stir the ingredients together as you add them. After you have completed this take the lettuce leaves and place them on a plate so that they face upwards and then place a mint leaf on top of them before placing the chicken mixture on the leaves and sprinkling with peanuts. The leaves should then be carefully rolled and eaten along with the dipping sauce. It is also possible to substitute, if you prefer, tofu in place of chicken meat. To do this it is best to slice the tofu into cubes before mixing with sesame oil and mixing with vegetables. 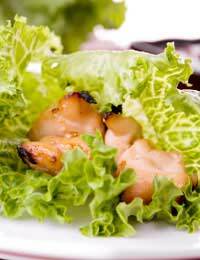 Other types of meat in place of chicken is also an option, to add a little variety to the dish. This can be other white meat, such as turkey, or red meat such as pork. The little chicken salad rolls dish is very colourful, which is often a good indication that the dish contains within it a vast variety of minerals and vitamins.